Farm“her” Jenny Quiner, a Des Moines native, has been busy digging at D.U.G.– that is Dogpatch Urban Gardens. 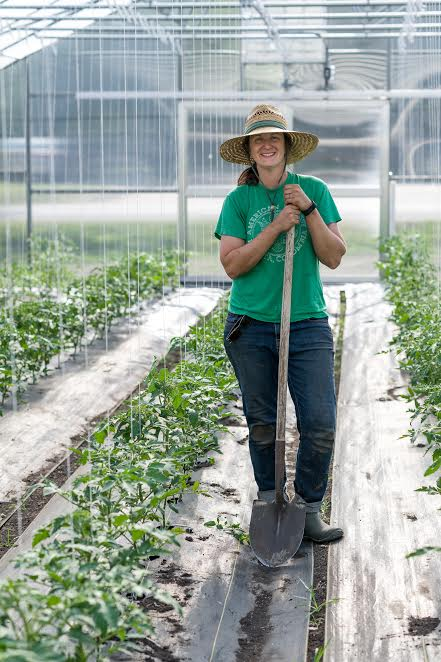 Busily in her second season, she has embraced small-scale farming and completely utilizes the farm’s 1/4th acre. Dogpatch Urban Gardens is a mix of conscientious and purposeful farming centered around health, community, education, and environment. Before she took up in the field, Jenny was a Science teacher at Dowling Catholic High School for 6 years. During her teaching career, Jenny and her husband Eric welcomed three sons. She would later feel a pull towards a new life direction and the Quiners serendipitously purchased the farm and dug right in. 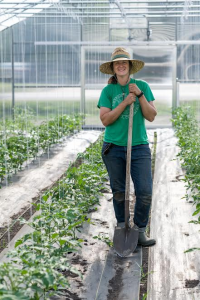 Jenny describes herself as a student of farming and is currently a member of Practical Farmers of Iowa and is participating in the Beginning Farmers Savings Incentive Program. It is her second season as vendor and market gardener at the Beaverdale Farmers Market. She specializes in growing greens (lettuces, asian greens, baby kale, spinach, etc.) and also grows root veggies, herbs, tomatoes, peppers, summer squash, and microgreens.